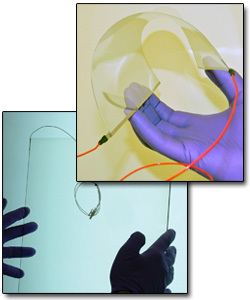 Transparent heaters are visually transparent substrates with electrically conductive coatings. When current flows across the coating, it generates heat. Dontech Therma Klear™ transparent heaters provide the warmth necessary to extend the operating temperature of LCDs (liquid crystal displays) in cold environments (e.g., from 0° to below -40°C) and for the anti-fog, anti-icing, and de-icing of optics and optical displays. Dontech manufactures heaters using different types of glass, acrylic, and polycarbonate substrates. Therma Klear Flex™ transparent heaters allow this same technology to be applied to flexible displays and optics. The transparent conductive coating in an optical heater is primarily comprised of different conductivities of indium tin oxide (ITO). The ITO can be dielectrically enhanced (index matched) to improve reflection and transmission properties in the desired optical performance band (e.g., visible spectrum, near IR). By index matching, reflection losses are converted to transmitted light. Dontech can index match the conductive coatings to air (n=1), to the optical substrate, and to an optical adhesive (n=1.43 through n>2.36). Standard conductivities for ITO coatings range from <1 ohm/sq to >250 ohms/sq. Applications include avionic displays, vehicle displays, mobile computers, kiosks, and handheld devices. For additional information on transparent heaters, please contact a Dontech applications engineer, download a copy of the Therma Klear™ series transparent heaters data sheet, or request that a hard copy of the data sheet be sent to you.